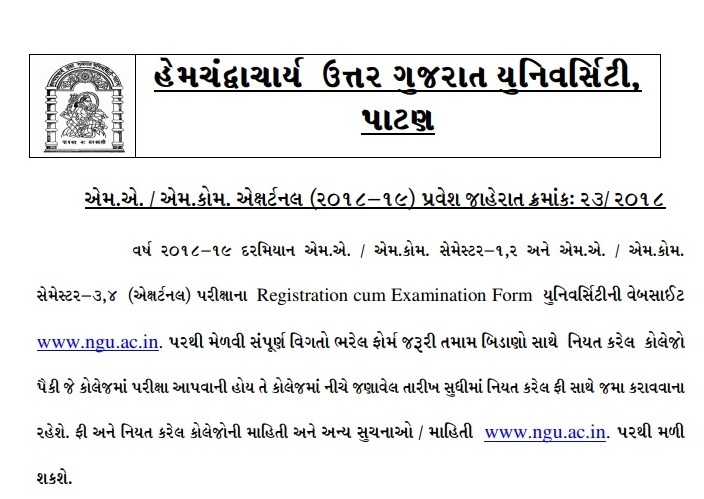 HNGU M.A / M.Com External Admission 2018 -19 Hemchandracharya North Gujarat University has released notification of HNGU M.A / M.Com Admission 2018 for the academic year 2018-19. for more details HNGU M.A / M.Com External Admission 2018-19 are given below . Course Name: M.A/ M.com -Semester 1,2,3,4. Last Date for Submission of Application :- 31/08/2018. About HNGU :The Hemchandracharya North Gujarat University is the public sector university. That was established in the year 1986 by the state government of the Gujarat. This university offer the various kind of the courses are relate to the under graduate and post graduate.This university offer the various courses such as B.A. (Interior Design), B.Com, B.Sc, B.A, B.E, Diploma, B.L.I.Sc, PGD, B.Tech, BBA, M.Sc., M.Com, M.A, M.B.A, M.Phil and PhD. in the all courses the university give the admission every year. The university will be also conduct the admission process for session year 2018.